These latest additions to our New England's Hidden Histories program come from our project partners at the New England Historic Genealogical Society. They include record books and associated material for three coastal churches founded in the late seventeenth and early eighteenth centuries: Sandwich First, the Congregational Church of Hull, and Newbury Third. The church records comprise registers of baptisms, marriages, and deaths, admissions and dismissions, meeting minutes, and tax lists. The Sandwich First collection includes town meeting minutes in addition to the ecclesiastical records. Sandwich's First Church was founded in 1638 as part of the original Plymouth Colony. The collection consists of two record books, cumulatively spanning 1691-1853. The first contains admissions, baptisms, proceedings, deaths, and dismissals ranging from 1691-1818. The second contains meeting minutes for the first precinct in the town of Sandwich, as well as those for parish meetings from 1786-1853. The First Church in Hull (formerly Nantasket) was founded in 1644. The volume comprises handwritten transcriptions from the First Church's records dating from 1725-1767. 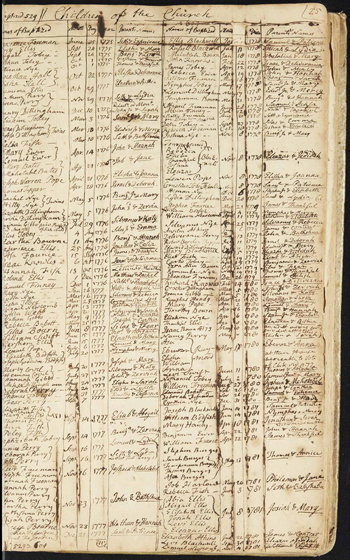 These include listings of baptisms, marriages, and deaths. The records were copied in 1847 by Charles J. F. Binney from the records of Rev. Ezra Carpenter for 1725 to 1746, and the records of Rev. Samuel Veazie for 1753 to 1767. The earlier records for this church (1644-1725) were destroyed in a fire sometime before 1847. The Third Church of Newbury, Mass. was founded in 1726, after the establishment of the First Church in 1635 and Second Church in 1695. The volumes were transcribed from various books and papers in 1737 by the church's first minister, Rev. John Lowell, and later continued by Edith R. Wills. The Third Church experienced a denominational split in 1746, when a number of parishioners left to form the Newbury Presbyterian Church. The Third Church became part of the parish of Newburyport in 1764.